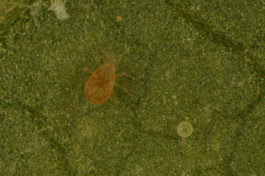 Amblydromella caudiglans is a predatory mite found throughout Canada and the United States on a variety of plant hosts, including apple and pear foliage. 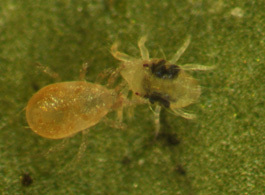 Like most predatory mite species, it is more commonly found on apples than pears. It preys on the European red mite, twospotted spider mite, apple rust mite, pearleaf blister mite, walnut blister mite, and brown mite. When viewed with a hand lens, Amblydromella caudiglans is indistinguishable from Galandromus occidentalis. However, it is considered to be a more effective predator of spider mites that produce little webbing (like European red mite) than of McDaniel or twospotted spider mite. Previous studies also suggest it may be less organophosphate (OP) resistant than G. occidentalis. While it was found in Washington orchards many years ago, it tended to be rare in commercial orchards where multiple applications of OPs were used. It has become more common as insecticide programs have transitioned away from these compounds. It appears to prefer similar climates to G. occidentalis and they can be found together in commercial orchards. Unlike G. occidentalis, A. caudiglans is not an obligatory predator of mites and can feed on pollen. Amblydromella caudiglans prefers to feed on European red mite and has difficulty consuming species like McDaniel or twospotted spider mite when large amounts of webbing are present. 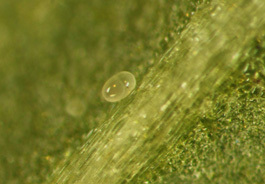 Also unlike G. occidentalis, it prefers to consume young motile stages (larvae and nymphs) of spider mites and reproduces and survives poorly on eggs alone. It is more likely to be capable of maintaining low densities of European red mite, as opposed to stopping outbreaks. 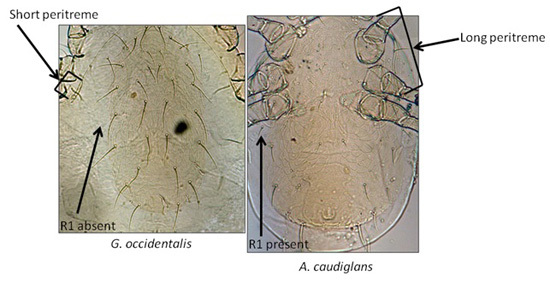 All stages of A. caudiglans look very similar to G. occidentalis. Slide-mounting of adult females is necessary to make species determinations between the two. The spermathecae and ventrianal plates of the two species are shaped differently. Amblydromella caudiglans possesses several setae (hairs) that G. occidentalis lacks, most notably R3. Finally, the peritremes (respiratory ducts) of G. occidentalis are much shorter than those of A. caudiglans. Examine the undersurface of leaves where mites are likely to be. Use a leaf-brushing machine to count both pests and predatory mites. Repeat samples at intervals to monitor changes in their relative abundance. Optimum predator-prey ratios have not yet been established for this predator. Clements, D. R. and R. Harmsen. 1993. Prey preferences of adult and immature Zetzellia mali Ewing (Acari: Stigmaeidae) and Typhlodromus caudiglans Schuster (Acari: Phytoseiidae). Can. Entomol. 125: 967-969. Denmark, H. A. and G. A. Evans. 2011. Phytoseiidae of North America and Hawaii (Acari: Mesostigmata). West Bloomfield, MI, Indira Publishing House. Krantz, G. W. and D. E. Walter, Eds. 2009. A Manual of Acarology. Lubbock, Texas, Texas Tech University Press. Downing, R. S. and T. K. Moilliet. 1972. Replacement of Typhlodromus occidentalis by T. caudiglans and T. pyri (Acarina: Phytoseiidae) after cessation of sprays on apple trees. Can. Entomol. 104: 937-940. Horton, D. R., D. A. Broers, T. Hinojosa, T. M. Lewis, E. R. Miliczky, and R. R. Lewis. 2002. Diversity and phenology of predatory arthropods overwintering in cardboard bands place in pear and apple orchards of Central Washington State. Ann. Entomol. Soc. Am. 95: 469-480. McMurtry, J. A. 1982. The use of phytoseiids for biological control: progress and future prospects. Acarology Society of America, San Diego. Putman, W. L. 1962. Life-history and behaviour of the predacious mite Typhlodromus (T.) caudiglans Schuster (Acarina: Phytoseiidae) in Ontario, with notes on the prey of related species. Can. Entomol. 94: 163-177. Putman, W. L. and D. H. C. Herne 1964. Relations between Typhlodromus caudiglans Schuster (Acarina: Phytoseiidae) and phytophagous mites in Ontario peach orchards. Can. Entomol. 96: 925-943. Putman, W. L. and D. H. C. Herne. 1966. The role of predators and other biotic agents in regulating the population density of phytophagous mites in Ontario peach orchards. Can. Entomol. 98: 808-820.